Pielke Sr. on Heat Wave in Russia | Watts Up With That? Heat Wave In Russia – Is It From Global Warming? Image: NASA Earth Observatory. This map shows temperature anomalies for the Russian Federation from July 20–27, 2010, compared to temperatures for the same dates from 2000 to 2008. The anomalies are based on land surface temperatures observed by the Moderate Resolution Imaging Spectroradiometer (MODIS) on NASA’s Terra satellite. Areas with above-average temperatures appear in red and orange, and areas with below-average temperatures appear in shades of blue. Oceans and lakes appear in gray. CLIMATE change has been blamed for floods that have killed thousands and left millions homeless from Pakistan to North Korea, fires and a heatwave in Russia that have left 5000 dead and disrupted global food markets, and a severe tropical storm threatening Bermuda. The weather drew comment from officials and activists at international climate change talks in Bonn. One US delegate said Russia’s heatwave and the recent floods that have devastated Pakistan are ”consistent with the kind of changes we would expect to see from climate change and they will only get worse unless we act quickly”. Part of the straightforwardness of that analysis is that it treats all the previous years equally. When instead Dr van Oldenborgh takes into account that there has been a general warming trend over those past 60 years the heatwave starts to look less improbable—more like the sort of thing you might expect every century. As the warming trend continues in the future, the chances of such events being repeated more frequently will get higher. A single heatwave cannot be said to have been caused by global climate change; but what is known about climate change says such heatwaves are now more probable than they were. The intensity of this heatwave has been remarkable. It is hotter than at any time in the instrumental record. According to an analysis by Geert Jan van Oldenborgh of the Royal Netherlands Meteorological Institute a straightforward comparison of the temperatures seen this summer with those of the past 60 years suggests that a large patch of Russia is experiencing temperatures which might be expected only once every 400 years or so. Some places within that patch are hotter than might be expected over several millennia. In a world where greenhouse warming gets stronger, the tropics expand—an effect the beginning of which has already been observed. The paths of the jet streams to the north and south of the tropics will change in response to this. What that means for the interactions between jet streams and Rossby waves that lead to blocking, though, is unclear. Tony Lupo, an atmospheric scientist from the University of Missouri, has been looking at the question with some Russian colleagues. He says their climate modelling provides some reason to believe blocking effects might become more common in a warmer world, but also less forceful. from added heating of the atmosphere from the absorption of solar insolation by aerosols from forest fires that occur in this dry environment. However, the statements that the tropics have expanded in recent years and the probabilities that such heat waves are becoming more common has not yet convincingly been made. Connolley W.M. 2008: Comment on “Was the 2003 European summer heat wave unusual in a global context?” by Thomas N. Chase et al. Geophys. Res. Lett., 35, L02703, doi:10.1029/2007GL031171. Chase, T.N., K. Wolter, R.A. Pielke Sr., and Ichtiaque Rasool, 2008: Reply to comment by W.M. Connolley on ‘‘Was the 2003 European summer heat wave unusual in a global context?’’Geophys. Res. Lett., 35, L02704, doi:10.1029/2007GL031574. Figure 1 updates Chase et al. through 2006 for 2.0 and 3.0 SD levels and adds to our original conclusion that 2003 was not very unusual in terms of the spatial coverage of extreme depth-averaged temperatures. However, the addition of three additional summers (2004– 2006) to the time series, all of which appear to be relatively warm, now indicates the possible emergence of an upward trend as suggested in previous work [Stott et al., 2004]. For example 2.0 SD warm anomalies now appear to have an upward trend (p = 0.05) though this trend should be viewed with caution because of the small sample size and the dominant effect of data points at the end of the series. The rise in 3.0 SD anomalies comparable to the 2003 heat wave is, however, still insignificant (p = 0.16) and so the increased probability of such extremes with time suggested by Stott et al. is not yet apparent. Tom Chase will be updating this analysis through August 2010 in early September when the data becomes available. Then, instead of qualitative claims about an expanding tropics and a greater frequency of heat waves, actual climate data will be available to quantify whether or not the claims made concerning the tropospheric temperature anomalies are robust or not. This warmth presents an opportunity in the coming months to assess whether this is really related to a long term global warming related effect, or is due to some other aspects of the climate system (perhaps as modified by spatially heterogeneous forcing due to human activity including land use change and aerosols). If it is a long term global warming signature, than the global average tropospheric warm anomaly will persist when the blocking pattern is removed. If, however, the lower tropospheric temperatures cool to or below their long term average and this heat cannot be found in the oceans, long term global warming cannot be the culprit. I will report on this early in 2011. August 14, 2010 in Climate News, media. And all this is due to an increase of only 0.6 degC since the year 1900? I was amused by the areas of anomalous cold immediately adjacent to the anomalous warm area. Overall, science at its best. Advance a testable proposition, with a clear description of a future test. Nicely done, my thanks, I await the outcome. Missing from DrPielke’s post was what I personally would consider an essential part of the discussion: how often is a similar heatwave likely to occur according to the best knwoledge of out climatic normals, or in other words, how likely was it that one should emerge this very year according to normal climatology? Watching national TV news here in the UK yesterday (not the BBC admittedly) I saw a lengthy studio presentation on the Russian and Pakistani weather extremes which included explanation of the current “stalled standing wave” state of the jetstream. The anchor asked the inevitable global warming question, to be told that any possible link was “not proven” by current models. The meteorologist then went on to talk about theories linking jetstream behaviour to solar activity. Never heard this mentioned on our MSM before. Never thought I would. It seems not everybody concerned is determinedly singing from the officially approved hymn sheet. Accuweather have an article explaining the recent heat wave in Russia. More of a weather event than global warming perhaps? Their interpretation suggests the action of the jet stream and a significant high pressure cell is to blame. The jet stream will be responsible for many extreme weather events in the near future and some say this occurs in the same time frame as low UV output. We have already seen the results of unusual jet stream activity in Sth America recently….. the northern winter is shaping up to do the same. In a recent Guardian article relating to the Russia fires, there was an interesting post by Trofim, indicating the fires a not all unusual. Here are some interesting historical accounts of forest and peat fires in Russia dating back to the 13th century. There occur every few decades. I can’t be bothered to translate it all, but have translated a selection. If you have any doubts, you can find yourself a translator. As for death rates, one can only guess. 1298: There was a wholesale death of animals. In the same year there was a drought, and the woods and peat bogs burnt. 1364: Halfway through summer there was a complete smoke haze, the heat was dreadful, the forests, bogs and earth were burning, rivers dried up. The same thing happened the following year . . .
1431: following a blotting out of the sky, and pillars of fire, there was a drought – “the earth and the bogs smouldered, there was no clear sky for 6 weeks, nobody saw the sun, fishes, animals and birds died of the smoke. 1735: Empress Anna wrote to General Ushakov: “Andrei Ivanovich, here in St Petersburg it is so smoky that one cannot open the windows, and all because, just like last year, the forests are burning. We are surprised that no-one has thought about how to stem the fires, which are burning for the second year in a row”. 1831: Summer was unbearably hot, and as a consequence of numerous fires in the forests, there was a constant haze of smoke in the air, through which the sun appeared a red hot ball; the smell of burning was so strong, that it was difficult to breathe. The years of 1839-1841 were known as the “hungry years”. In the spring of 1840, the spring sowings of corn disappeared in many places. From midway through April until the end of August not a drop of rain fell. From the beginning of summer the fields were covered with a dirty grey film of dust. All the plants wilted, dying from the heat and lack of water. It was extraordinarily hot and close, even though the sun, being covered in haze, shone very weakly through the haze of smoke. Here and there in various regions of Russia the forests and peat bogs were burning (the firest had begun already in 1939). there was a reddish haze, partially covering the sun, and there were dark, menacing clouds on the horizon. There was a choking stench of smoke which penetrated everywhere, even into houses where the windows remained closed. 1868: the weather was murderous. It rained once during the summer. There was a drought. The sun, like a red hot cinder, glowed through the clouds of smoke from the peat bogs. Near Peterhoff the forests and peat workings burnt, and troops dug trenches and flooded the subterranean fire. It was 40 centigrade in the open, and 28 in the shade. 1868: a prolonged drought in the northern regions was accompanied by devastating fires in various regions. Apart from the cities and villages affected by this catastrophe, the forests, peat workings and dried-up marshes were burning. In St Petersburg region smoke filled the city and its outlying districts for several weeks. 1875: While in western europe there is continual rain and they complain about the cold summer, here in Russia there is a terrible drought. In southern Russia all the cereal and fruit crops have died, and around St Petersburg the forest fires are such that in the city itself, especially in the evening, there is a thick haze of smoke and a smell of burning. Yesterday, the burning woods and peat bogs threatened the ammunitiion stores of the artillery range and even Okhtensk gunpowder factory. 1885: (in a letter from Peter Tchaikovsky, composer): I’m writing to you at three oclock in the afternoon in such darkness, you would think it was nine oclock at night. For several days, the horizon has been enveloped in a smoke haze, arising, they say, from fires in the forest and peat bogs. Visibility is diminishing by the day, and I’m starting to fear that we might even die of suffocation. 1917 (diary of Aleksandr Blok, poet): There is a smell of burning, as it seems, all around the city peat bogs, undergrowth and trees are burning. And no-one can extinguish it. That will be done only by rain and the winter. Yellowish-brown clouds of smoke envelope the villages, wide swaithes of undergrowth are burning, and God sends no rain, and what wheat there is in the fields is burning. Collect the facts, develope falsifiable theories, show caution and restraint in early assessment and continue the research, until your results are sound and proven bbeyond doubt. It’s a pity one has to applaude to something which should, in fact, be the state-of-the-art in Climatology. Personally I try not to read anything which “analyses” the current event. Climate science says it cannot predict any single event. However it can predict that these single events will be more frequent and more severe over the whole world generally. Which meand that some people may be shivering in a colder than average, but not record, year, but others will by dying in much higher temperatures which are a record. AND these events will happen much more often. Think once a decade instead of once every 100 years. I’m fully aware that once per decade is way, way too much concentration time for the masses; but; if it saves you life??? What’s the effort worth then? I like to look at older articles which predict these things are going to happen then try and see if they match what is happening. You know the only way to be absolutely 100% sure that the predictions are correct on AGW is to carry on the way we are going and see if the predictions are true. Now I don’t know about you but that doesn’t seem quite reasonable to me. But then I’m not suicidally minded. Are we seriously supposed to start panicking because somewhere on the surface of Planet Earth experiences some climatic condition that “might be expected only once every 400 years or so”? Or even “over several millenia”? Excuse me if I’m being obtuse. But isn’t that absolutely normal for what (it is suggested) is an “extreme” climate event? After all, in civil engineering, large dams are routinely designed to safely withstand the (projected) effects of a “one in ten thousand year” flood. Now, we don’t actually have accurate rainfall and river guaging data from before the time of Noah and the Gopher Wood. What we are actually trying to do is to design dams to withstand a 0.01% probability of occurring in any year. Standards in the nuclear industry are even higher. And, by the very nature of the exercise, no one can predict with absolute confidence how any structure (even a natural structure) might actually perform in the face of a very extreme condition. You just have to do your best to reduce risk to an acceptable level. So it is a commonplace that there can and will be “extreme” events somewhere. And, without evidence (even a plausible hypothesis would be good) that CO2 has any effect whatever either on the “extreme event” itself, or even any effect on the probability of any given “extreme event” occurring (perhaps increasing the probability of some defined event from 0.01% to 0.011%), then this is debate that may appear to be interesting but is actually predicated on a complete falacy. A 400 year heat wave in an area in Russia? Wow! This is about as exciting as the apocryphal news story “small earthquake in Paruguay, few killed.” Obviously, if you happen to be in Paruguay at the time your perspective changes. But as an excuse for going to a Low Carbon Energy Policy, NOW, it is absolutely too silly to laugh at. Did heat create conditions for the wildfires or did the wildfires create the heat? Many sources put the start of the summer fires in May, worsening in June continuing throughout July. So this excessive heat is caused by a blocking event resulting from a ‘standing wave’ in the jet stream. Both strong wave (westward propagating) and weak wave (moving East) conditions are known. Conditions happen to be ‘just right’ for the sationary wave to form. Presumably temperature differentials help to determine the strength of the Rossby waves. The globe does not warm evenly – the Arctic will warm (and cool) more than lower latitudes – does it necessarily follow that warming will create more ‘just right’ conditions for blocking events to occur? We’re back to what climate models say again. If this was using weather models not climate models I’d have a little more confidence. This is another thread highly relevant to my ‘New Climate Model’. The thing is that the jets can only meander about so much when they move equatorward during a period of tropical contraction. When the tropics expand the jets get pushed poleward and are unable to meander around so much hence less blocking the more poleward the jets move. Now at present, the jets are well equatorward despite the recent El Nino and they have lots of room to meander about with lots of blocking going on. The thing is that during the late 20th Century warming spell El Ninos of a similar intensity sent the jets much further poleward. The only change since then is the level of solar activity and I have been proposing for some time that lower solar activity leads to a more negative polar oscillation with stronger polar high pressure cells and jets pushed equatorward. This pic is worth a 1000 words. The ice pool in the foreground has been freezing more and more this last week. The artic refreeze has begun even before the thaw was over. This is going to be a mamouth year. A few degrees will not kill the whole planet you silly man! The worst it will do is make some parts hard to live in (and currently cold places better, of course). If we over-compensate for CO2 generation we will doom billions of people to continued poverty, as they will not have the power generation that is an essential part of a rising economy. Until the advent of fusion power, we need carbon to run the world. Once fusion comes along we won’t need silly treaties to stop burning oil anyway. I personally am not willing to kill billions of people on the “precautionary principle”. I will need good, robust proof before I start to thing CO2 is a bigger problem than world poverty. But then again, I don’t think you have to be dirt poor to be good. But the hypothesis is Anthropogenic Global Warming…..
It’s not unexpected that Russia, or anywhere for that matter, would have a hotter summer than usual. It’s been getting warmer globally since about 1850-ish…. What was the mechanism for causing a warming during the Medieval Warm Period, prior to substantial Anthropogenic CO2 releases from industry?…. What cooled the atmosphere prior to 1850-ish? What caused the warming from 1850-ish to 1940? …. and why can’t those same unknown reasons be causing warming now? What stuns me most, is the almost REGULAR distribution of “heat cells” over the medium (?) latitudes of the globe in the second picture. It reminds me very much of the distribution of sunspots on the Sun’s surface, when it’s in a phase of high activity (which it is not, actually). So we might witness a larger principle at work here -i.e. patterns of latitudinal gas flow in rotating, spheric systems. Under this premise, the “heat cells” would be more attributable to adiabatic heating of descending masses of air in anti-cyclonic high pressure cells, which are modulated and separated by the meandering jetstream. You can see for yourself a couple of threads down from this one how a 30 year old prediction is shaping up. ____http://joannenova.com.au/2010/08/is-the-cold-weather-coming/, Guest Post by Bryan Leyland: El Nino/La Nina effect (SOI) predicts global cooling by the end of 2010. Furthermore, the winter 2009/10 was the coldest in North Europe for about 30 years. After a cold winter the Baltic Sea is colder than usually. The colder the Baltic Sea (and other regional waters) during spring and early summer are, the more they support continental conditions, resulting in less humidity, less clouds, but more sun shine in Russia. Even if this scenario contributed only to a small percentage to the current Russian summer, it should be investigated and named. At least it is to little when the Russian scientist Michail Kabanov says: It’s more just a temporary natural occurrence. Apologies. A 20(ish) year old prediction.. Very interesting post, I like how dr. Pielke makes this testable in a real scientific way! According to an analysis by Geert Jan van Oldenborgh of the Royal Netherlands Meteorological Institute a straightforward comparison of the temperatures seen this summer with those of the past 60 years suggests that a large patch of Russia is experiencing temperatures which might be expected only once every 400 years or so. Aha, but if you only use the last 60 years, you’re including a large cold period. How about using the last 80 years? Or how about the last 2000? This is why Steve McIntyre’s work on the hockey stick is so immensely important, because if the hockey stick were real, claims like these would be far less controversial. IMHO our current knowledge of past climate events do not warrant computing any meaningful such confidence intervals at all. Extreme weather events are part of a probability distribution – if you plot, say, the maximum daily temperatures for July in Moscow over a few decades, I presume you will see something like a normal distribution, with the most common values at the peak and the rarest values at the tails. Those rarest events are necessarily the most difficult to assess over time, since by definition we have to wait a long time to record a small amount of data. That makes it difficult to say with any confidence that extreme warm or cold weather is showing any change in frequency over time. However… it’s much easier to detect changes in the most common values – a shifting of the probability distribution towards one of the two tails, i.e. warmer or colder. My reading of the IPCC reports is that we are already seeing widespread shifting of probabilities towards more warm days and nights, and fewer cold days and nights. If that is the case then we can be fairly confident that those extreme values on the tails of the distribution are going to be changing too, even though there may not be enough data from those rare events alone to prove it. The reasonable conclusion, I think, is that we don’t have to wait for lots more extreme weather events to come along before we can say that the probability of such events has increased – we can see that the whole probability distribution has shifted and conclude with confidence that the extremes are changing too. You sound young and impressionable. This is not the first time an ‘expert’ predicted disaster(s) using some handy trends. Absolutely, if it happens every 400 to 1,000 years. Russia had one of these (arguably not quite so severe), 80 odd years ago. How frequent does it have to get to catch your attention? Every other week? By then the biosphere won’t support humans at all. How does that help anything? During a warm period 6,000 years ago, the Indus was a monster river, more powerful and more prone to flooding than today. Then, 4,000 years ago, as the climate cooled, a large part of it simply dried up. Deserts appeared whether mighty torrents once flowed. Professor Clift believes that this failure of the Indus may have triggered the collapse of the great Harappan civilisation. The city ruins of Mohenjo-daro, a relict of this lost culture, date from the time when the rivers ran dry. I read once that some people from the Chamber of Commerce were in Russia doing whatever it is that they do, and they were trying to explain the concept of a Volunteer Fire Dept. The Russians thought that was the silliest idea they had ever heard, the story goes. To “volunteer” time, and “work for free?” Insane. Perhaps that was just one town. Maybe the story was “overplayed.” I don’t know; it just popped into my head. So why does CO2 only heat up a little spot in Russia and not the whole globe? I mean it does heat up the air everywhere doesn’t it? It’s was worse than we thought. Here is a look back at the top world’s worst natural disasters in history along with dates and the number of deaths. No mention of AGW. 66 of the world’s worst natural disasters going back 900 years. Without drought we would not be here!!!! A geologic perspective. The russian heat wave, the european heat wave in 2003, the floods in China, the cold wave during winter (in both hemisphere), are consistent with the fast mode atmospheric circulation according to Marcel Leroux Theory. My 2 cents… If I recall correctly, the same thing happened in 2000 when we were coming out of solar minimum, just not as strongly on the scale, as compared to this time. An intrusion beneath the south flank from July-December 1999 was accompanied by increased seismic activity and was constrained by tilt measurements, GPS-geodesy and InSAR. We had the reflective sulfur in the NH stratosphere from the volcano eruptions during the ramp down of solar cycle 22 (which weren’t nearly as big as the ramp down of cycle 23) which had dissipated and dropped down when Eyjafjallajökull eruption loaded the NH troposphere with volcanic ash, gasses and water vapor. From what I’ve learned, ash aerosol absorbs Ultraviolet, among other things. 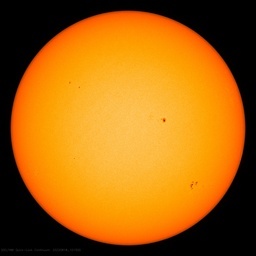 Ultraviolet radiation is on the increase at times now as this solar cycle is trying to ramp up, same as it was in 2000 after the 1999 eruption of Eyjafjallajökull. The southern USA is warming up quite nicely also. But head north and you encounter sharp temperature gradients from hot to cold as one would expect after a long, deep solar minimum following a group of larger high altitude eruptions in 2008-2009. I suspect that’s what’s going on over there. A high level of ash particulate makes clouds and heavy rains in places, sorry all you GCR believers, but its an established fact. OKMOK Aleutian Islands 2008 Jul 12 4? There’s nothing unnatural going on here, its just happening on a grander scale than usual this time around because the players involved are also grander. With regard to the instructive post by ‘Oakwood’ it really is so very simple to check and verify just how regular the stationary hotspots over Russia occur and just how widespread the peat and brush fires were in the historical record. The obvious holes in the reasoning and theories put forward are little short of amazing, no research into the Russian archives and no peat bog coring histories have been looked at or even tried to verify the written record. Taking simple peat bog core samples will tell anyone who cares to look in great detail all the facts and stats. The saddest thing about this episode is the utter lack of disciplined scientific method, the narrow perspectives and the refusal to look at the issue in anything other than a very limited way. Its almost as if the MSM have chosen to listen exclusively to scientists who have made their minds up before gathering all or even any of the evidence needed to reach a balanced and well thought out conclusion. The evidence is waiting to be discovered and the historical record is waiting to be examined but it seems those investigating have already made up their minds in the style of “we dont need no stinking evidence”! Very sad indeed and an indictment of the modern scientific standards or lack thereof and I would have expected more from Roger Pielke senior and his university, very lazy and poor article IMHO starting out with a predetermined conclusion and then filtering out or excluding unwanted or contradictory evidence. Sorry but that is not science as I understand the term, it is simply narrative building and narrative support. 1[x]65: chronicles wrote: ‘the sun was like blood, and it was spotted black, and mist covered everything. Half a summer heat and drought were great, forests, bogs and lands burning, rivers thinned, some dried out completely (sic! ), and there was scare, and terror and great sorrow among all the people’. In fact, heat waves battered land form 1[x]63 through 1[x]68. The latter year was so hot that mist covered land for three months, and fishes in water bodies would die. 1[x]71: even greater drought visited Russia; All the land was covered with smoke from burning peat bogs and forests. People ‘could not see each other as far as 1 sazhen’ (approx 7 feet). Bears, wolves and foxes sought shelter in cities. 1[x]74: chronicle says ‘not a single drop of rain fell throughout entire summer’. Drought was followed by epidemies among people and livestock. Btw., who could guess what digit is hidden behind the [x] symbol, and how much did oil cost? Hi Steve, in the north that may be true, but down here in the south we are experiencing the most positive phase of the Antarctic Oscillation since records began in 1979. This helps a La Nina phase to grow but is in direct opposition to what’s happening in the Arctic. Having said that there are big incursions of Antarctic air venturing into Sth America this winter, the normal climate models are not playing the game. It should be called the Moscow heat wave. Much of Russia has been below normal. Well, we know what happens when we act quickly. The last time we tried that, a lot of Wall St. Bankers got very rich at the expense of million of jobs and homeowners. The NASA Earth Observatory image shows “global warming” to be rather selective. Would someone care to explain a mechanism of increased CO2 that could create this selective behavior? (or perhaps the CIA is behind it). When I was a li’l kid in 50’s, Dad bought me a translation of a Russian book entitled “Changing Our Planet”. Of course, there was a load of ideology about how the Siberian rivers will be turned sothward to water the Asian deserts etc., but related to the Big Changes there was also a lot of information about various natural disasters in Russia, that would be averted by the future clever engineering of the Nature. However, I still remember reading about terrible droughts in the past,burning forests and crops and bringing famine in the otherwise fertile chernozem regions around Volga, just as it happens now. A dry hot wind was mentioned named “sukhovyey” that dried leaves on the trees before your eyes. Even winds carrying black soil instead of rain were observed. I was quite happy that I did not live there, as such extreme weather conditions did not occur in the central Europe due to Atlantic influence. So this situation in Russia is definitely nothing entirely new. Thank you! These brief entries tell more in a few words than Mann-kind does in a whole book. Tealeaves decay over time. Same for probabilities. At this point in human development, ‘Probability’ distribution is only good for short timeframes. Mann-kind would be better off forcasting climate in 5 Year Packages. In so many ways we’re still looking at the shadows on the back of the cave wall and guessing very poorly about the ‘what it is’ that causing them. I have a feeling that AGW would then not be a problem. But here, now? I’m just trying to stay cool – it’s going to 101-102 today. (111-112 if you use that humidity thing) I have a feeling that Mother Nature could support us if there were 5 billion less of us, heck, maybe she could do it if we were back down around 50K. Not to worry! Even dinosaurs die off sometimes; why should we complain? Again, the Alarmists make fools of themselves. The current warm-core anticyclone has its genesis in the mid-latitudes, and not the tropics. Something similiar is occuring over North America. These are called blocks, or blocking highs. The physics are quite simple. Once a blocking high establishes itself, large areas of adiabatic warming occur. When these blocks are located over land, the effects are even more pronounced. Droughts, and extensive heatwaves occur. When these blocks persist, the air becomes stagnant. In areas up and downstream, high level cyclones pull cool air equatorward. The Jetstream also shifts equatorward. It is not unusual for areas either up or down stream of a block to see the opposite (unusually cold or wet weather patterns). So heat 150 years ago and floods 150 years ago were not caused by CO2 and now they are? I am guessing that cooler ocean temps not only moves the jet stream around but also slows the jet stream down thus reducing the amount of water vapor and precipitable cloud/pressure systems that ride that stream and fall as moisture on land. A faster jet stream keeps the weather more variable so that hot and cold spells are short. When the jet stream is slow, our naturally arid land (compared to the oceans) are allowed to dry out, resulting in prolonged hot temps during the warm season, and frigid temps during the cold season. Wonder what the water vapor index has been that allowed Russia’s peat to dry out? Wouldn’t be CO2 related, because that causes more water vapor to rise from the oceans. The jet stream appears quite weak at the moment. Notice that the lack of water vapor in Russia is exactly where the heat wave is, so CO2 can’t be the driver here. If this keeps up, fall will be marked by early frigid temperatures. What below average precip there is will fall as snow, and lakes and rivers will freeze hard. It will not be a pleasant winter in Russia. And the monsoons that caused Pakistan and Southern China to flood could turn into nasty cold winter weather there as well, with much of their usually rainy weather turned into rare blizzards. Steven, your nose is growing. Most of Russia is having a heatwave. A heatwave with temperatures 10 – 18 degC higher than average. About 1/3 of Russia is experiencing temperatures 1-3 DegC lower than normal. Stop trying to pedal something which isn’t true. Yes CO2 does heat up the whole planet. That’s why 2010 is hotter than both 1998 and 2005 for the first half of the year (globally). We’ll just have to see how the “whole planet” fares for the rest of the year. Oh and for the record, Russia, Germany, the Netherlands, the easter seaboroard of the US, Australia, Pakistan, the whole of the middle east and India have all recorded heatwaves this year. Russia, Pakistan, several states in the US and several countries in the Middle East have also recorded record all time record high temperatures this year. Thanks Geoff but I’ve noticed that and consider it to be a short term effect of the recent El Nino which has more power in the southern hemisphere and so gives a harder push poleward than in the north. As you then point out the Antarctic incursions of cold air towards the equator show the effect of the quiet sun pushing back. Longer term and separating out the ENSO effect I believe my account still holds. It’s a matter of balancing oceanic and solar effects globally with the two hemispheres responding a bit differently due to the different land/ocean proportions. The anecdotes from people of note in their time, from Oakwood, is a lovely counter to the alarmist non-science. The more we look at weather the more we understand the world’s past; the more we understand and know about the past the less beievable the catastrophists become. 85 5th grade scientists say the fires are not caused by CO2. Fires are caused by a combustible, an ignition source and O2 and create heat and CO2. Let Joe Romm know that fires increase CO2. This smoke is not from automotive exhaust. How much of this Russian even remained on the European side of the Ural mountains? If we are going to blame global warming for the heatwave around Moscow and environs and we are in lockstep with CO2 as the culprit, Gee, the CO2 must have been high there. Ice core data apparently shows that CO2 follows the temperature rise (outgassing from the ocean?). Certainly CO2 follow the fires!! – would the science say that a static body of hot air, full of forest fires would become even more hot because of the increasing CO2 locally? Note the countervailing deep blue cold zones around the area – have these been depleted in CO2. You can see that it aint as simple as Delta T= 4.7Ln(C/Co). You see, this is the kind of nutty stuff that comes from trying to twist CO2 dunnit into centre stage. A one-week 90d+ event might be quantified as a 1- year probability, whereas if it was 100d+ it might be a 25-year event while 105d+ might be a 50-year event. Yet a 3-day 105d+ event might be a 1-year probability and a 4-week 90d event might be 50-year probability. These changing variables in events become curves of probability which can be seen in his attribution the event in Russia might be a 400 year or 1,000 year event. So, “arguably not quite so severe” heat waves, if proven to be less severe, will have a different probability of occurring and probability will be that they occur more often than ones which are more severe. And when you say the one 80 years ago was arguably not quite so severe, it might be that those are ones which have a probability of occurring every, um, 80 years and has nothing to do with more severe events which Brumby happened to suggest might occur every 400 (or 1000) years. Also note that they are “probability curves” and inherently there is the possibility that, say a 100 or 1000 year event might occur two years in a row. It is even possible that a 100 and a 1000 might occur in the same year. The Accuweather article by Gina Cherundolo doesn’t contribute to the understanding and features a graphic that is at the opposite of what satellite animations show. shows that the anticyclone agglutination on western Russia is fed by southward moving MPHs coming from the pole and not by an influx of “desert heat”. Accuweather satellite animation of the equally stationnary Hawaiian agglutination this summer has shown its clear replenishing by colder air masses through the west coast, hence the cooler LA summer, dry yet not overly warm western Canada weather. MPH pulses can be traced and mapped to confirm this. So much for the predictions of a massive winter in the NH. With all this water vapor the clouds will form and slow the escape of heat. Unless we get a stratosphere reaching volcano or two pretty soon, warmth is roaring back. The AGW alarmists will have a clustergasm! I note the phrase ‘probability curve’ the art of taking one event and extrapolating a whole series of conclusions on that narrow base, its called gambling odds. The horse that wins a few races has the odds cut because the probability is that the horse might win however this is where the gambling comes in, the favourite does not always or even mostly win, there is a multitude of variables that affect the outcome like wet/dry ground etc and weather and in science gambling is not the basis for a theory. God does not play dice! If a probability curve was drawn up at the inception of the nylon flared trouser craze it would predict the earth would be covered in them to a depth of several meters by 2100. The inclusion of a variable in the form of rising temperatures simply means the construction is invalid from the start because it means IF the global average temperatures increase, the whole probability curve hangs on one base variable that is highly unstable, if the GAT does not rise or even falls slightly then the entire construct is false. The probability curve does not include historical data from observation or data from core samples and solely relies on a base event and a suspect base variable so in reality and effect it is just meaningless waffle, a modern casting of the bones. When the historical record is included in a major and comprehensive way then the probability curve may start to yield interesting results but not until then. A theory like a house needs solid foundations, a half arsed probability curve fed with wishful thinking and partisan prejudice is like building a house on quicksand IMHO. Rant time for the redhead. Climate zones are far more relevant than political boundaries. Weather pattern variations don’t give a tinker’s dam about political boundaries. But they do pay attention to topographical climate zones. I could care less how much or how less Russia is experiencing a heat wave. What matters are climate zones within pressure cell systems along the path of an active jet stream (or in this case, an inactive one), and the weather pattern variations on the outside bands of the pressure cells under the jet stream. Anyone who thinks in terms of political boundaries has no clue about weather or climate, and even less about the sources, behavior and affects of CO2 and other greenhouse gases. They do, however, have agendas to state, though often couched behind “I’m here to save the day” rhetoric. And we had the dust bowl that lasted almost a decade, this is just one summer. Masters over at WhinyUnderground just had to mention global warming. Like a 1/2 degree made any difference. What exactly do people think happens when the jet stream re-groups? But I would ask you whether or not is reasonable to conclude that you could find the heat in the oceans (assuming we saw a lower tropopsheric cooling), or that indeed, there could be other “heat sinks” where this heat could go. With the natural cycle of the growing La Nina, slated to last until early 2011, it seems perhaps an odd time to be looking for missing heat in the oceans, and perhaps a foregone conclusion that you’d not find missing heat during a La Nina episode (if indeed, SST’s were the location in the oceans you’d go looking for this heat). I am neither young nor impressionable. Certainly I won’t be impressed with a cherry picked chart designed for no other reason than to show a point of view, regardless of reality. I note that most tend to try and bend what I say to their point of view. Well here it is more simply laid out. Extreme events are happening more frequently. Catasrophic events will become more common as the sea and the atmosphere heats. Fact, not fiction. I must admit I find some of responses here quite amusing. Let me put it simply. When the water dries up and the crops die do you think the other 8 billion on the planet are going to go quitely? Think again, they’ll take you all with them in a fit of human revenge as everybody climbs over everybody else in a mad scramble to get to the resources that are left. Climate science is not in doubt and the more you create graphs to deny it and make long speeches to try and avoid action, the worse the end result will be. For you. That’s not alarmism. That’s factism. Let me put it simply. When the water dries up and the crops die do you think the other 8 billion on the planet are going to go quitely? Think again, they’ll take you all with them in a fit of human revenge as everybody climbs over everybody else in a mad scramble to get to the resources that are left. “Factism” sounds a lot like hysterical anger. Hyping things up, and the media reporting them more, does not make them more. We have had nothing in “extreme events” like we have had in the past. Perfect example was the American dust bowl that lasted almost a decade. If something like that happened now, can you just imagine how hyped up it would be? Since I was the only one that used “probablility curves” (Brumby implied it, but didn’t use it) it would have been a little more courteous to have directed your rant towards me and concentrated on my comment, rather than mindlessly bringing horse racing, God, dice, and flared trousers into it. Your generalization of probability curves as art, extrapolations, what it does and doesn’t include, and that it is no better than casting bones, shows that either you like to rant; don’t know much about such things as, for one, rainfall intensity tables; or are well versed in meteorology and just don’t think my constructing one for comparison sake to highlight a relationship between severity and frequency is suitable. If it’s the first, I’ll factor that in for the future. If it’s the second, I’d be happy to educate you. If it’s the third, then I’d appreciate you saying so and stating the reasons why so I can learn something. Right now, it looks like the heat in the ocean is rather getting exhausted, as El Nino is spent and the upwelling is generally much colder than the present Nino SSTs. This is something to keep an eye on, for the cramped jets streams rule the circulation patterns in a thwarting manner and diminish the W/m2 that the oceans may absorb. Typo: you have added a “t” to your last word. So let’s see here. CGW is responsible for droughts… and floods. Seems I’ve heard it reported that the monsoon in Pakistan is the worst in 80 years. The heat wave in Russia is the worst in 1000 years as some pundits have claimed, but records show it was worse about 135 years ago. And with the world running a fever—and the prescription is more cowbell NOT more cows–t—have you checked into what’s happening all along the Pacific coast, from Cali to Chile? Brrrrrrrr. I think some parts of Brazil got snow last week. You appear to exhibit the symptoms of emotional attachment to a political cause, you may have been infected by a kind of hysteria common among alarmists in general. This irrational fear of the future based on wholly hypothetical possibilities feeds itself and infects others, it is a fear of the future and it is truly dangerous because it hinders and sabotages rational debate and cautious common sense. The hysterical fear that the world will end in blood and fire is not new, the bible tells of an end of days. The oceans are in fact cooling NOT heating up, the poles are stable and there is no death spiral, extreme events are NOT increasing in intensity and frequency as the fall in hurricane/major storm activity proves, droughts are less common and rains are falling where no rains have touched for decades and even centuries, deserts bloom and wildlife follows. Spain is faring well with rains more frequent than in past years and in north Africa the deserts shrink and become more inhabitable and after the ‘big dry’ in Australia the interior is greening on a scale not seen for a century. The bitter winter in the southern hemisphere is being hidden with a fanatical determination because it contradicts the alarmist narrative. Above all do not panic and do not fear for the future, the greatest enemy of humanity is not some prophesied catastrophe where the world ends in fire and flood, the greatest enemy is fear and ignorance and mob hysteria. The world is bigger than the MSM/alarmist lobby would have you know, there is more positive and hopeful news than the unholy axis dares admit, the rains come and the winters are still cold, the oceans are cooling and the sea is not going to drown us all. Take the time and find out the positive news from around the world, look where those with an agenda would prefer you did not and you will find that far from from a biblical disaster there is new hope and new life all governed by a series of wholly natural cycles. I do not wish to be rude but predicted events that have not yet occurred cannot be represented as fact because they have not yet happened, only when an event has occurred can it be accurately portrayed as a fact. NeilT, you sound a little emotionally driven. Please supply a link to data that shows that “extreme” weather events are linked to AGW and becoming more frequent. Hmmm. I know what you mean. But that’s just what Michael Mann, Al Gore and Jim Hansen do all the time. They are little monkeys, aren’t they?! Yeah, right. But you spelt fascism incorrectly. “This map shows temperature anomalies for the Russian Federation from July 20–27, 2010, compared to temperatures for the same dates from 2000 to 2008. The anomalies are based on land surface temperatures observed by the Moderate Resolution Imaging Spectroradiometer (MODIS) on NASA’s Terra satellite”. Temperature anomalies compared to a recent 8-year record? Surely there must be something wrong if even distinguished scentists such as Dr. Pielke Snr. think that such anomalies are worth further investigation. A similar anomolay in comparison with an 80 year record might, perhaps, justify the hooha. You seem to be of the mindset that ‘something must be done before it’s too late or else’. Ok! Who’s going to pull off your miracle? And, what is it again that “”””THEY”””” are going to do? And, what is it that “”””WE”””” have to do? Not only do you find “doubt” among us, you will also find “anger” at the idea that some idiot like Mann or Gore or Jones is going to tell us/me/you what it is we’re going to do for the rest of our lives. Normal environmentalists attribute the Pakistani floods to deforestation and destruction of the watershed. That is the real reason, not Al Gores infamous carbon foot print or Streisand’s private jet. oakwood’s post pretty much settles it. It’s a weather event, not climate. 40 C in Moscow in 1868. That just about puts the wraps on this whole wad of climate change BS. We could all move on to something else if we didn’t have a bunch of leftists trying to use it to do something about the four billion too many of us. Russia has peat bogs. They have been draining the water. 90 years ago they started taking peat from the bogs to fire electric generation. 4,200 acres are involved in fires now. These fires are far from being only recent events. Men draining bogs is however in the last 200 years. As soon as we drain the everglades, we can have more fires there. And then blame cars. There are more cars in Florida than Russia. Why don’t we have fires down there? Back in those days, heat waves were as common as the dog days of August: No matter where you went, it was hot, muggy, and miserable. A warm breeze felt like a flame thrower, and the only respite was the local swimming hole. Sleeping was an unholy hell of sweaty misery. Nothing much has changed, save for the unrelenting rhetoric from the clueless propagandists spouting their usual diatribes. They have no memories of the distant past, and so have no concept of the likely future. If they all freeze to death, it will still be our fault. When the water dries up and the crops die do you think the other 8 billion on the planet are going to go quitely? Think again, they’ll take you all with them in a fit of human revenge as everybody climbs over everybody else in a mad scramble to get to the resources that are left. The world may get hotter. I won’t get drier as a result. Indeed the increased atmospheric water feedback is a key plank in the AGW theory. It will rain more, which may not be a good thing. There may be isolated areas which dry up, but there will be dry areas that become wetter. Food production in the hot regions will be more than compensated for by increased production in what are currently cool zones. How many of the world’s hot zones are currently unproductive? What other “resources” could possibly be affected by climate? Iron? Sand? Aluminium? Really, even if AGW comes along, a resource crisis is the last problem. You are alarmist, sorry. Malthusian alarmist, in fact. And Malthusian alarmists have been railing – incorrectly – since Malthus started. AGW or no AGW, the sky is not about to fall. Please document whatever other variable you may be referencing. If research reveals a global warming signal in this it must also explain the killing cold in South America concurrent with the Russian heat wave. I believe Roger is writing of Ocean Heat Content and not SST. It’s iCO2 now, it’s very clever, it can choose to bunch up together and warm up different parts of the globe. Moscow’s always been hot in summer, it’s inland, I mean if you cut more trees down and put more concrete, drain the peat, fire all the fire wardens you will get fire! I was in Moscow about 10 years ago, and it was boiling, was wearing shorts I remember clearly that I was because I wasn’t allowed into some of the churches because I was wearing shorts. Just because it gets cold there in winter doesn’t mean it can’t get hot in summer, it’s an inland city. The aerosol component of an eruption, resulting mainly from the emission of SO2 and H2S, affect the Earth’s radiation balance, principally by reflecting sunlight back into space and cooling the planet. By serving as cloud condensation nuclei, sulfate aerosols are believed to change the microphysical structure, water content, lifetime, and extent of clouds. Not only the type and magnitude but also the location of an eruption are thought to determine its climatic impact. When sulfur dioxide (boiling point at standard state: -10°C) reacts with water vapor, it creates sulfate ions (the precursors to sulfuric acid), which are very reflective; ash aerosol on the other hand absorbs ultraviolet. Ash aerosol absorbing UV is probably the best kept secret of the CAGW alarmists. Ash aerosol in the troposhere, down where we are, will cause significant warmings when absent reflective sulfate aerosols at or near stratospere level. CO2 is not a very powerful GH gas, and an extremely low percentage of our total atmosphere. Evidence has been accumulating for decades that volcanic eruptions can perturb climate and possibly affect it on long timescales. The gangsters who thought this whole CAGW scheme up cannot tax volcanoes for profit for their emissions. But people on the other hand can be taxed once convinced their emissions are this huge problem. I used to believe we were a huge problem, but not anymore. Your just going to have to look for yourself and this is a place to start. your predictions on increasingly extreme weather events are from the same source as this prediction. Ah, Scarlet, you need to study more on political science!!!! -Every “Department of Climate Change” (no, not dept. of silly walks) in every western nation has a little knob in the head office. For the UK this was controlled by the (Milli) band of brothers. -By turning this knob you can control the CO2 heat effect. Dont you remember Merkel and Brown arguing who could promise the most number of celsius reduction? 2 or 3 degrees, wasnt it? Now, how do you think they could promise such a thing without that knob? QED. Am sad, it seems nobody here read Marcel Leroux and his theory of Mobile Polar High. Dynamic Analysis of Weather and Climate, 2nd edition (2010) is great, and his Global Warming: Myth or Reality? is a must ! Assuming the blue line is the Southern Hemisphere it looks like SST was quite strong enough a few months ago to have the observed effect. The oceans form a larger proportion of the southern hemisphere and will not need such a large anomaly to have the observed effect on the jets. Note that the recent AAO spike is an exception to the generally more negative AAO since the turn of the Century so the background trend of a more negative AAO stands despite the recent spike. Seeing the more recent drop the positive AAO anomaly is going to disappear soon enough. The red line is skewed by the still warmish northern seas left over from earlier El Ninos but because northern oceans form a smaller part of the northern hemisphere the effect on the jets is less pronounced. From about 20 years ago. I think that is support for my more recent contentions about the way the air circulation patterns are affected from above. All one then needs to do is propose variable rates of energy release from the oceans and describe the interaction to lead to the general thrust of my NCM (New Climate Model). When that paper was written we had far less data about the extent of SST variability around the globe on multidecadal timescales. Furthermore they would be highly sensitive to the strength of the temperature inversion at (and the height of) the tropopause. A warmer stratosphere would lead to a more negative polar oscillation and a cooler stratosphere a more positive polar oscillation exactly as observed in the late 20th Century as compared to now. The trouble is that according to established climatology a more active sun is supposed to lead to a warmer stratosphere. I think there has been an error there. I most certainly agree. Roger Pielke senior should have known better than to post a half baked, under researched article here at WUWT. It might fly at less rigorously checked sites but not here. Anyone following this site knows the ocean oscillations have recently changed, and during the last half of the 20th century the sun has been very active according to this paper and NASA This is no longer true as we enter the new century according to the Solar Dynamics Observatory Mission News So with major changes in two of the biggest drivers of the climate, the oceans and the sun, why the heck would anyone expect the weather patterns to remain the same? Woods Hole Oceanographic Institution even wrote an article about it. “Most of the studies and debates on potential climate change, along with its ecological and economic impacts, have focused on the ongoing buildup of industrial greenhouse gases in the atmosphere and a gradual increase in global temperatures. This line of thinking, however, fails to consider another potentially disruptive climate scenario. It ignores recent and rapidly advancing evidence that Earth’s climate repeatedly has shifted abruptly and dramatically in the past, and is capable of doing so in the future. Fossil evidence clearly demonstrates that Earthvs climate can shift gears within a decade…. Whenever the CAGW scientists mention the sun they are always are quick to point out the TSI varies by less than 0.1% over the solar cycle. Too bad Roger Pielke senior is wearing AGW blinders, they get in the way when doing science. Please do so. Your reply does not. Your reply, without a link to some kind of data, appears to be speculation. Southern hemisphere: Small anomaly, large oceanic effect on jet streams. Northern Hemisphere: Large anomaly, small oceanic effect on jet streams. The reason being the different ocean/land distributions. The evidence is that produced by you and Geoff. Geoff points out that the AAO is currently more positive from the recent El Nino than is the AO. You point out that the AO is not as positive as the AAO despite a greater northern hemisphere SST and TLT response. The reason is the different hemispheric jet stream responses to the differing proportions of ocean in each hemisphere. In the northern hemisphere a greater proportion of temperature variability is land induced which does not have the same jet stream shifting power as ocean induced temperature variability. I suspect that the difference is humidity based. Water vapour being lighter than air ocean induced high humidity/high temperature effects will have more effect on the global air circulation systems than land induced low humidity/high temperature effects. Also, land effects decline at night but ocean effects are persistent day and night. You can call it speculation if you wish but I see it as a reasonable interpretation of the same sources that you rely on. My interpretations may differ from yours but that’s science for you.